Year by year Odessa UA becomes more and more beautiful and manicured city-resort. Dozens of old historical buildings have been renovated; hundreds of new Odessa hotels and restaurants have been opened for the last years. New parks, beaches, indoor and open-air swimming-pools, casinos and bars give Odessa tourists everything they need to have fun day & night. Prices are rising every year, as Ukrainian economy is getting stronger and stronger, but anyway Odessa offers something special for tourists with any budget. 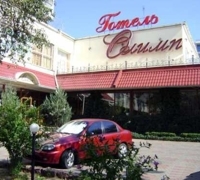 You can choose Odessa apartment accommodation close to the Black sea or city centre and not expensive meals at the nearest Ukrainian cafe or you can stay at the one of the best Odessa hotels listed below. We'll be happy to help you with choosing the right hotel for your needs and budget. The only five star hotel in Odessa located at the Odessa Sea Trading Port, just a minute walk from the famous Potemkin Stairs. All Odessa hotel rooms have Black Sea view. Rooms feature a large desk, direct dial telephone, PC connections, safe, mini-bar, air-conditioning, SatelliteTV. Hotel has indoor swimming pool, fitness centre, sauna, solarium, 24-hour room and concierge service, own water supply and electricity power plant. Renovated in 2003 Palace Del Mar resort is one of the best places to stay in Odessa. Most rooms have open terraces with a sea view. Every room is equipped with air-conditioner, mini-bar, Satellite TV, digital phone line, and has cable Internet. Hotel services include free guest parking, 24/7 security, room service, business centre, outdoor and indoor swimming pools, sauna, tennis court, medical clinic, SPA, beauty salon and Mediterranean restaurant. Built in 1867 and decorated in the style of early Renaissance, Odessa hotel Londonskaya is an architectural monument of the city. 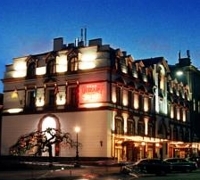 Hotel is ideally located in the heart of Odessa — Primorsky Boulevard — within a minute from the Opera and Ballet Theatrе. 54 comfortably furnished rooms have Satellite TV, telephone, refrigerator and private bathroom. Guests have at their disposal an elegantly furnished restaurant with European and Ukrainian cuisine, coffee shop, bars, casino, hairdressers` and beauty parlour. 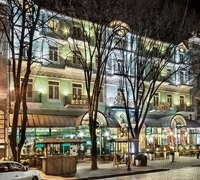 Mozart Hotel is a respectable and elite 4-star hotel in the very heart of Odessa. 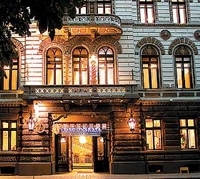 Superb location - right by the famous Odessa Opera House - and classic style of the building lend special charm to this small private hotel. All 40 rooms are air-conditioned, have Sat TV, free WiFi phone, mini-bar. Bathrooms feature bathrobes, slippers, complimentary toiletries, and hair dryers. In addition to in room safes, guestrooms offer phones. Restaurant with excellent European cuisine, bar & banquet hall. 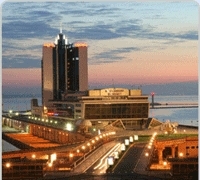 Hotel is located close to the sea, in one of the most picturesque resort areas of Odessa - Arсadia. Hotel offers 24 comfortable rooms including 4 Suites. Rooms are equipped with direct dial phone, Internet access and interactive television, mini bar, individual air-conditioning. The interior design of each room produces the style of luxury that will satisfy the taste of most demanding guests. Enjoy delicious French cuisine as well as traditional European cuisine accompanied by an extensive choice of wines in the “Opera Prestige” restaurant, the “De Voland” lobby bar or at the "Cascade" bar by the pool. The masterpiece of a famous architect Frants Frapolli - Hotel Frapolli on Deribasovskaya is a nice mix of classical traditions & modern style. Hotel provides 27 rooms, including 15 rooms with balconies opening on Deribasovskaya. Each room is air-conditioned and equipped with a telephone, satellite TV, a minibar, a safe deposit box, climate control system, towels, bath essentials, bathrobes, and slippers. Restaurant "Frapolli" with outdoor tables, lobby area, rooms and veranda of the hotel are covered by Wi-Fi Internet access. Cozy private Odessa hotel Olymp is located not far from the beach and in the midst of one of the most scenic areas of Odessa. Elegant equipped and air conditioned rooms await their guests and offer all amenities like shower/bath, WC, cable TV, telephone, mini bar and safe. The hotel restaurant “Horets” offers a rich selection of European and traditionally Ukrainian meals. Guests can relax at the welllness center and choose between a swimming pool, Russian or Turkish bath, sauna or a massage. Hotel offers laundry service. ticket reservation for theatres and concerts. Find out more about apartments, hotels and other tour services we provide in Odessa and browse photos of our Kiev Apartments, Odessa Apartments, Dnepropetrovsk Apartments, Kharkov Apartments, Lviv Apartments and Zaporozhye apartments.